Champione! Champione! ole! ole! ole! Wow Jon, you seem to have the magic touch...congratulations on promotion yet again. Welcome back to professional football. The first order of business, unfortunately, is to find a replacement poacher for Nicholas Bignall. We did everything we could to sign him on a permanent basis but simply don't have the funding to do so. Once we secured promotion Bignall was finally willing to listen to our offers, but then his agent got in the way. His agent wouldn't budge on wage demands that were in the 8k p/w range and our board would only allow half that. With the chase on to find his successor, we got to work quickly. Our first big transfer signing, and the first to step into the poacher role will be Adam Birchall. You can see that Bignall is the more physically gifted across the board, so it remains to be seen whether Birchall will be able to get free like Bignall was often able to. Birchall is definitely the more mentally gifted, however, so maybe that will help. 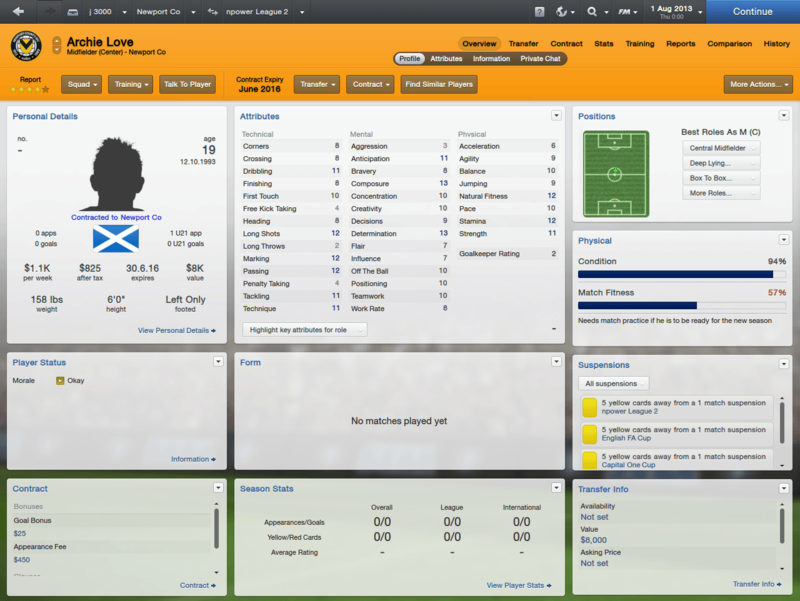 We're also working on a loan deal for Luca Scapuzzi from Man City. I originally looked to sign him outright, but with Birchall signing I'm not in such a hurry to spend 90k on another striker! If we can get Scapuzzi on a loan I think we'll be pretty set at striker and we can look to strengthen other areas. How are your 'keeping stocks looking Jon? I have always found it strange that a decent striker is always more expensive then a decent keeper; although in the beta - is there such a thing? Best of luck signing Scapuzzi though! 2012-10-29 05:07#68959 Kiwi : How are your 'keeping stocks looking Jon? I feel pretty good about my starting keeper, especially after looking through transfer targets for a backup! Your question prompted me to look a little deeper though so I pulled up the two teams that have the best odds (5:2) to win the league - Carlisle and Yeovil - and scouted their keepers. At Carlisle you have Glenn Morris. I like our keeper better, although Julian is pretty bad at kicking, rushing out, and throwing. At Yeovil you have Marek Stech, and I have keeper envy! Stech is the better keeper, no questions asked. I think the bottom line is that we should be ok in between the posts this year. We'll definitely keep an eye out for a quality keeper but we're in no hurry to replace Alan Julian. He allowed 36 goals in 34 matches last year and kept 9 clean sheets and I'd like to think that he can get the job done again. With preseason friendlies beginning it's time to look at the starting eleven and seven man bench. 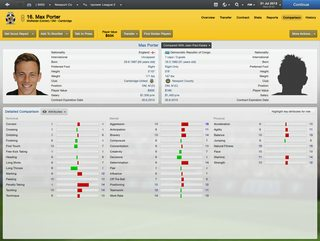 In the starting eleven we have three new members - Peter Bore at right wide midfield, Jean-Paul Kalala (I think I had him in FM11!) at right center mid, and Adam Birchall at poacher. Peter Bore isn't anything special, but he's a slight upgrade from last year's starter, Ryan Charles, who becomes the backup. I'd still like to upgrade at this position down the road to someone who's more of a threat out wide. Jean-Paul Kalala only cost us an 8k transfer fee and he's the kind of upgrade I'm looking for! JPK outclasses Porter in nearly every meaningful category other than being slightly worse in terms of teamwork and work rate. 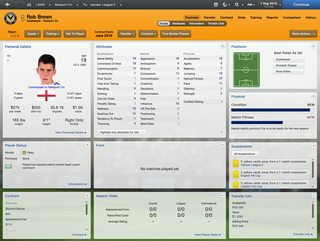 JPK should solidify our defenses and help us cope with our first season in League 2. And as discussed earlier, Adam Birchall is the man to step into Nicholas Bignall's shoes. We made a 28k investment in him and I'm really interested to see how this transition from a more physically talented to a more mentally talented player will turn out. And now let's take a look at our restocked bench. We have four new faces in our now 7 man bench, and a fifth new face in our reserves that should get some playing time with the first team as well. Archie Love comes in as our primary backup to JPK. Being only 19, he has the potential to eventually replace JPK in a few years. Mehdi Lazaar is our backup trequart and while he isn't ideal (low composure, lowish passing, anticipation, agility), he has some growth potential. Guy Madjo will be the backup poacher that can pretty easily step into the starting role if Adam Birchall falters. Rob Brown is our backup keeper, and he's a bit of a project as well. At 19, he can probably start in a pinch and play against weaker sides while he continues to train. Matthew Blinkhorn may not get much time with the first team, but he's a decent option at both striker positions. He's a great finisher, but his low dribbling, concentration and positioning may prevent him from being a really great attacking option. City were happy to loan him to us for the season, but Scapuzzi balked at the notion. Then a month later, he agrees to go on loan to Macclesfield. This is a team that did not earn promotion last year so they are still in the BSP, one league lower than us. This is a team that was in 2nd place for most of the season, right behind us, before a monumental collapse led to them ending the season in 9th place. To be fair, Macclesfield do have better training facilities so maybe that's what drew Scapuzzi to them. And the irony is that if the similiar situation played out in real life, you would turn out for a League 2 club over a BSP side, especially if you were pretty much guaranteed first team action. 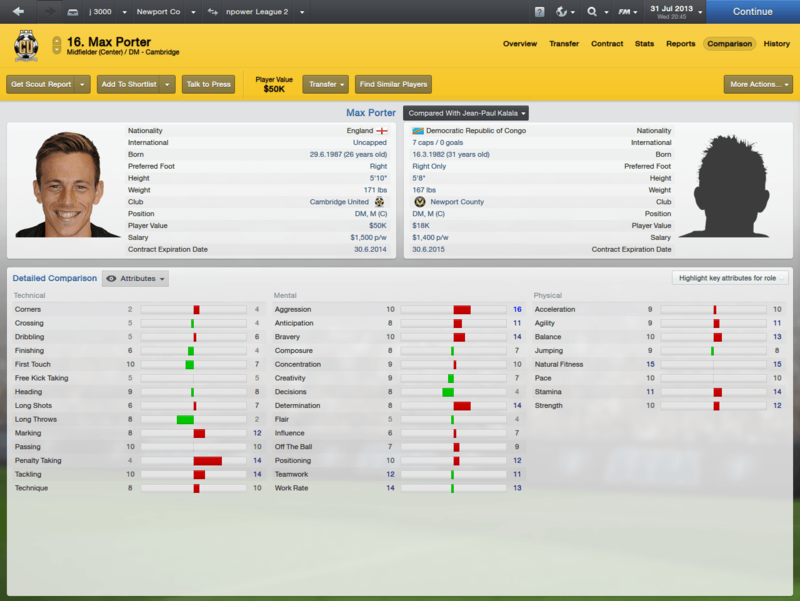 The new team looks like they should do great things in league two, especially with your tactical mastermind. I will never get how you can get so many players that fits your system well and in check with your wage budget! Amazing! #SPURSNEWARMOUR 2012-2013 Champs in the making? 2012-10-29 12:32#69011 xXBlueXx : I will never get how you can get so many players that fits your system well and in check with your wage budget! Amazing! That's why I've fallen in love with the 442 formation, especially for lower leagues. You can get a lot more versatility out of players and a lot of times you can get a center mid that's both cheaper and more capable than you can get an AMC, for example. 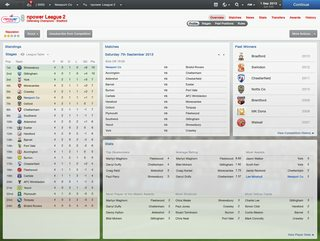 Our first month in League 2 was a bit of an eye-opening experience, both good and bad. 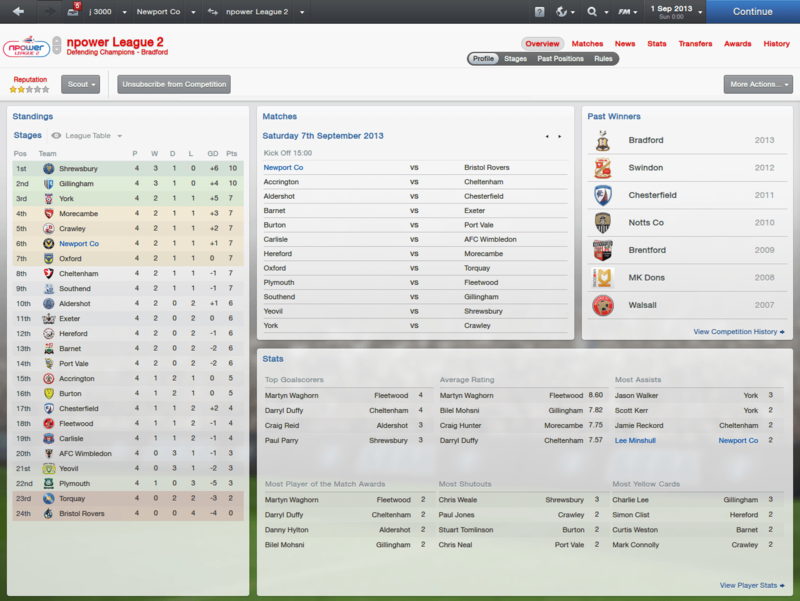 We opened on the road against Cheltenham and the 1-2 final score makes the game look a lot closer than it really was. We got less than half the amount of shots off that Cheltenham did, and a 92nd minute goal by Danny Crow is all we could manage. 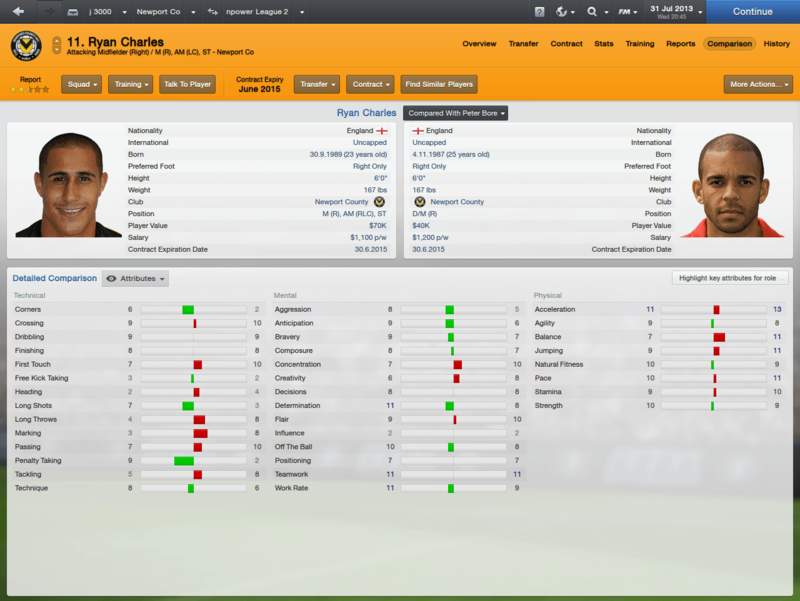 We bounced back well in our first home league game against Chesterfield. After surrendering the lead on a 49th minute score, we leveld things on the hour, with Archie Love scoring his first goal for the club. We were then gifted an own goal when Sam Hird cleared a ball off the back of a teammate into the back of the net! We had our first breakout game offensively against Crawley, and our leaky defense needed it. We gave up an early goal only 8 minutes in, but Danny Crow responded 5 mintues later. 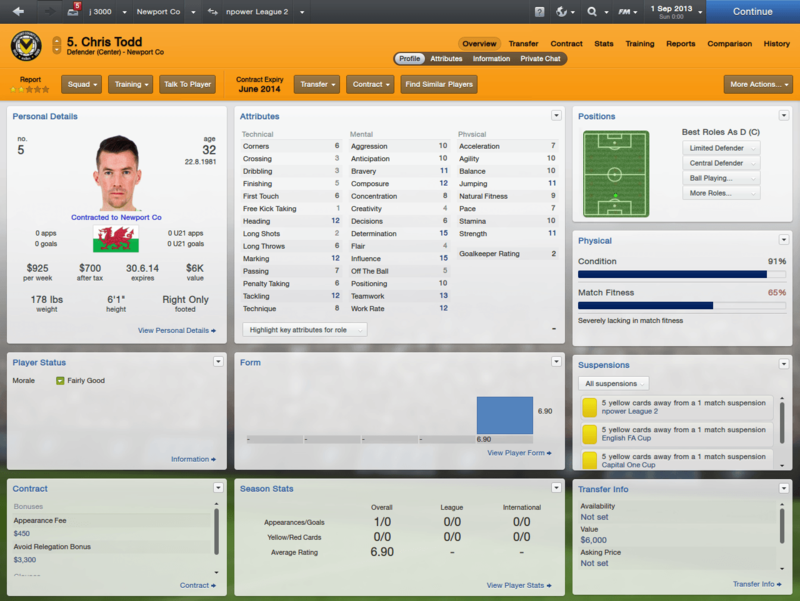 Peter Bore then scored his first goal for the club in the 27th minute. We held that lead for a while, but gave up the tying goal 38 minutes in. The second half didn't feature nearly as many fireworks, with the only (and game-winning) goal being scored on a penalty by new poacher Adam Birchall. Our next game featured more of the same - strong offense, leaky defense. We held a 2-0 lead at the half against Torquay and looked good doing so. And even after they fired back with goals 10 mintues apart (54', 64'), we retook the lead in the 66th as Adam Birchall was on target once again. All that work was undone late, once again, as we gave up the tying goal in the 85th minute. We got quite a difficult draw in the first round of the Capital One Cup against League 1 side Swindon. I was happy that it was a home game, at the very least. We played defensively to open things up and did a good job of limiting chances and frustrating the opposing team. Then we gave up a STUPID goal in the 25th minute. Alan Julian thought it would be a good idea to walk down to the right side of the box and clear the ball out to the center of the pitch. Naturally, it was intercepted about 40 yards out and James Collins quickly trapped the ball and rifled it in before Julian could get back for a block attempt. I just about broke my desk when this happened. We opened things up in the second half to chase for a tying goal, but couldn't find a way through a superior defense. Then it happened. In the 81st minute, Adam Birchall broke through on a sublime through ball from Danny Crow and the game was tied. The home crowd was in a frenzy and we kept pushing as time kept ticking down. Who else could it be, other than Adam Birchall again? This time, he latched onto a long pass from Thomas Butler, froze the keeper with a quick stutter, then slammed home the winning goal! Our reward for such a dramatic finish? Another home game for the second round, this time against Liverpool! A record setting crowd of 5511 were in attendance for David to take on Goliath. We learned a few tactical tricks in our games against bigger teams already, so we set out with an air of cofidence. Would you believe it, we went into halftime tied at zero! We took very few shots, but forced Liverpool into a lot of bad ones. The same pattern followed in the second half and we looked like we would at least stun the world with a draw. Then in the 77th minute, Christian Fuchs got through the defense but he was too far forward. He cut in towards goal but he was left with an impossible angle and no defenders to lay off to. SOMEHOW he gets a right footed shot off that bent perfectly around the keeper and curled just inside the far post. The air left the stadium and the fight left our players as we walked off 0-1 losers. The Johnstone's Paint Trophy kicks off in September and our first game is against a familiar foe - Swindon. I'm sure they will be looking to get some revenge after we booted them out of the Capital One Cup, but we will be looking to tip the apple cart again. Hopefully we've learned a few things since our first meeting. A boring win will be just fine for me! With the first four games of the long 46 game season in the books, we sit defiantly in 6th place, tied with 5 other teams that also have 7 points. It's entirely too early to start predicting a run at promotion, but the early signs are definitely pointing towards more positives than negatives. We have six games on tap for September and after these we can start to see where we stack up against the competition a bit more clearly. We will face off against Bristol Rovers (24), Shrewsbury (1), Fleetwood (18), Morecambe (4), Port Vale (14), and Gillingham (2). The restocking of our roster didn't stop in July as we added five more players in August, all free transfers. All of these signings were also very friendly on our weekly wages so we still have 5.59k p/w to potentially spend (and a 133k transfer kitty) if some outstanding targets become available. Michael Drennan was brought in because the more I thought about it, the less I wanted to rely on Mehdi Lazaar as my backup trequart. Brynmor Blain was too promising of a poacher to give up. We don't have the facilities or staff to ensure that he will blossom, but he will be an intriguing prospect regardless. Chris Todd was signed to give more of a veteran presence in our back four when players need to be rotated. Nortei Nortey is another prospect for the future. He has ridiculous speed and has the makings of a fantastic offensive threat from the fullback position. That, and he has a badass name! Jordan Copp gives us more depth at several positions. He will play primarily at midfield, either centrally or out wide and he can also drop back and play left fullback in a pinch. Good start to the season. 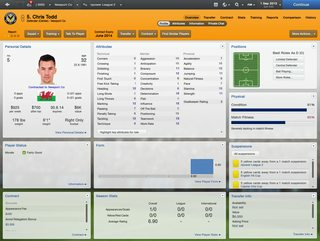 What is your total wage budget? 2012-10-30 09:25#69138 Moppy666 : Good start to the season. 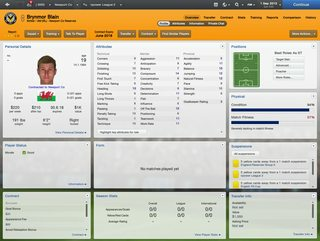 What is your total wage budget? 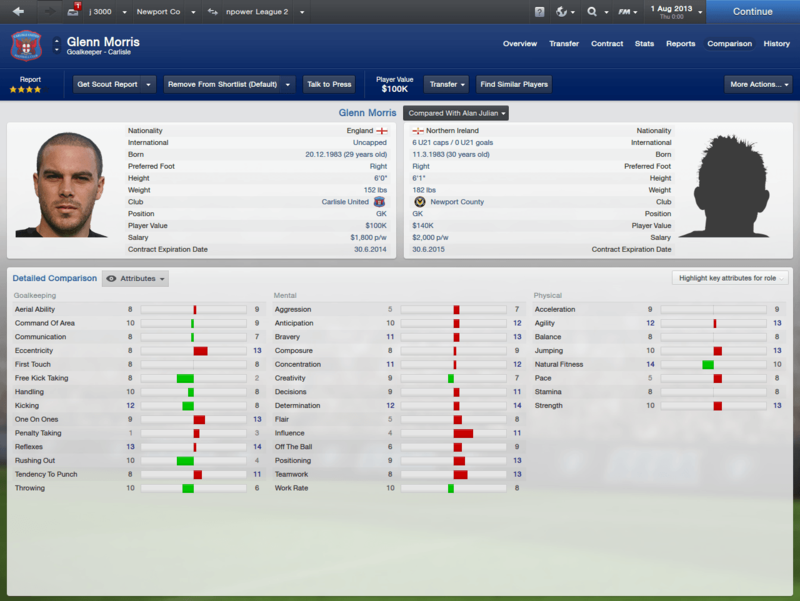 We told the board that we would avoid relegation and they gave me a transfer kitty of 133k and a budget of 36.29k p/w. Those are huge increases from last year thanks to our promotion and cup runs, as well as the increases in sponsorships and ticket sales. nice work.. have u done any tweeks to your 4-4-2 tactic? or do u just go for standard and balanced? Those are some great numbers in context to where you were last season. Based on what you did in BSP, I believe you will finish at worse in the top half of the table. You are reading "I seem to recognize your face - Newport County". Handcrafted in Symi, Hellas. Page created in 0.829 seconds.